President Donald Trump has repeated his prior threats to close the U.S. border with Mexico, Axios reports, with a move as soon as “this week” (i.e. from April 1 onwards) in a measure that “could be (applied) to all trade” according to an official transcript. The move would be in response to concerns about continued mass migration from Central America and follows the President’s decision to cut aid to three countries including Honduras, according to Reuters. 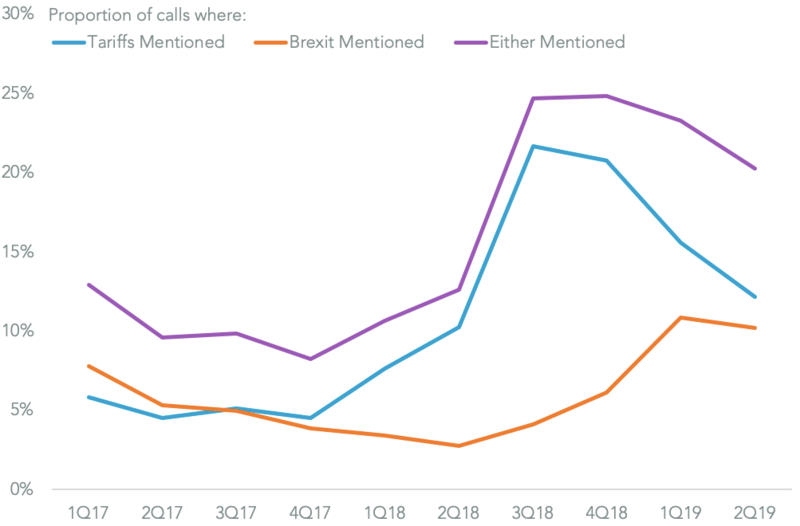 Presuming the President’s reference to trade covers specifically trade via truck then the closure would have an impact on $484.4 billion of bilateral trade in the 12 months to Feb. 28, Panjiva data for Mexican imports and exports shows, or 64.5% of the total. 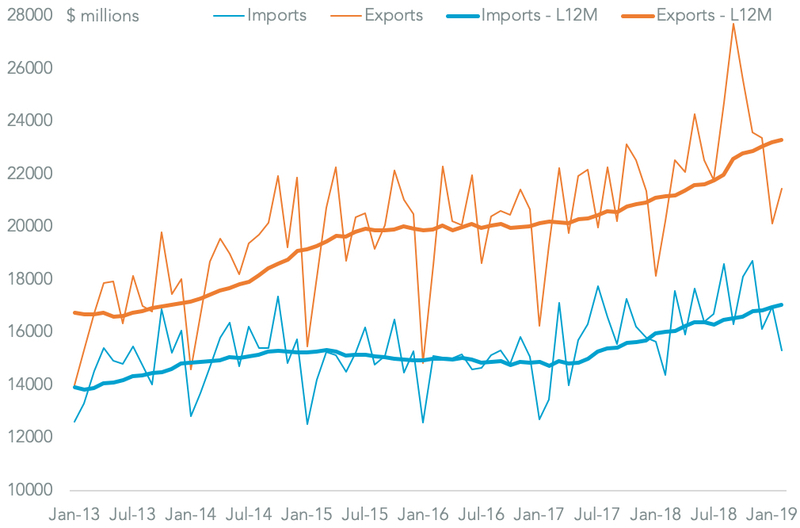 Proportionally Mexican exports are more exposed to trucking than vice versa in accounting for 70.7% of total shipments in the past 12 months. Logically shipments of perishable goods and those involved in just-in-time manufacturing processes would be the most exposed to the customs complications resulting from a border closure. 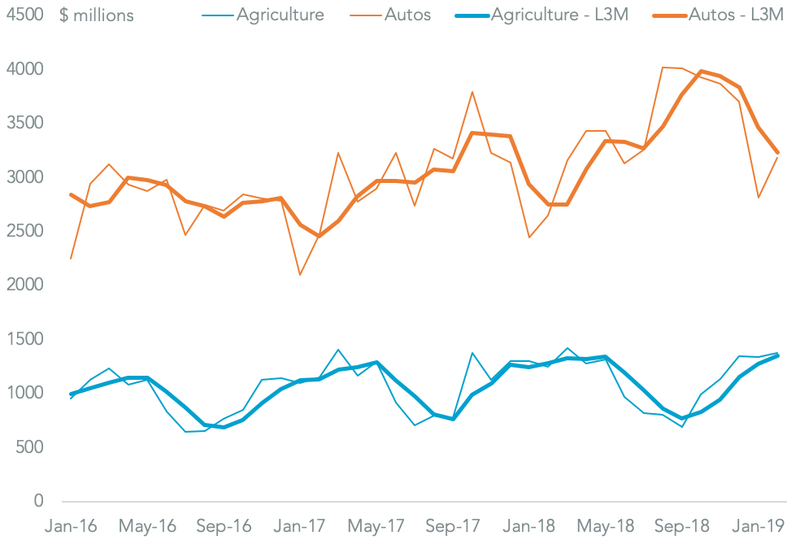 Shipments of agricultural products can ill-afford disruptions given Mexican exports to the U.S. by truck only increased by 0.5% year over year in the 12 months to Feb. 28 to reach $13.5 billion, though that has accelerated to 5.5% in the three months to Feb. 28. 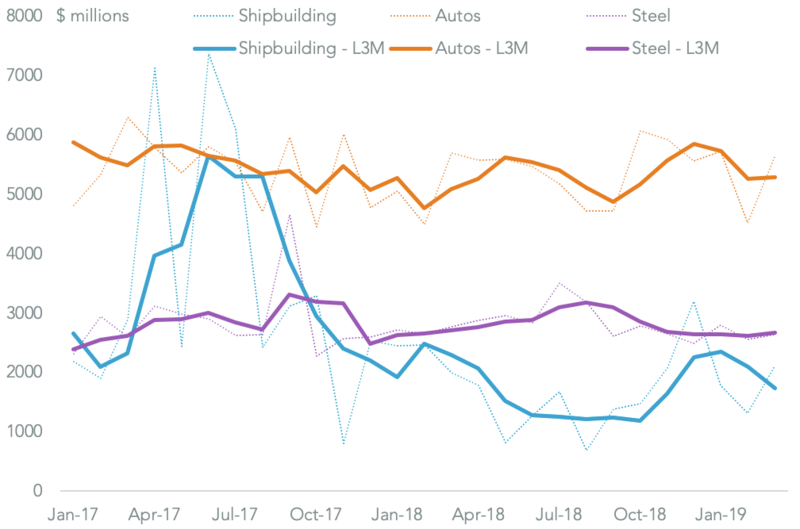 Automotive industry exports meanwhile soared 25.6% in the past 12 months, to reach $46.0 billion, and 17.7% in the last three months. Mexico’s truckborne agricultural exports are led by fruit, which accounted for $6.47 billion of exports in the past 12 months, or 47.9% of the total, followed by vegetables at $5.15 billion with all other products including meat, dairy and fish representing the remainder. 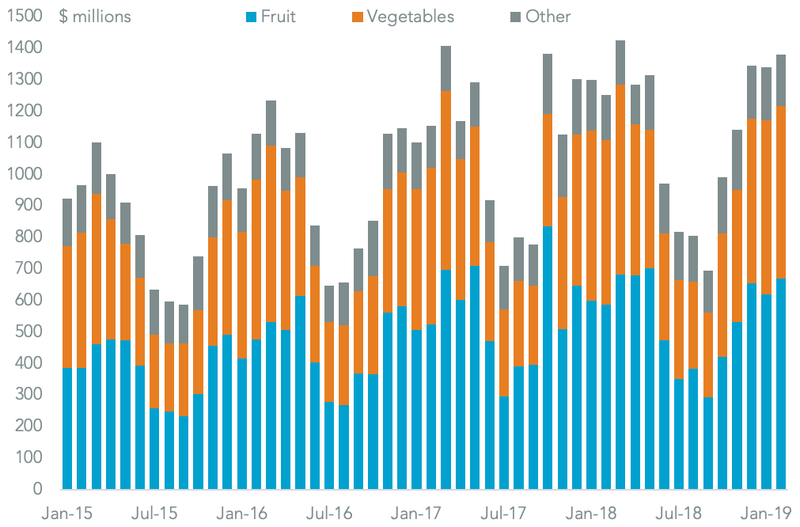 The downturn in shipments in the past 12 months has been down to a 4.1% drop in shipments of fruit, though like other products there has been a rebound more recently. 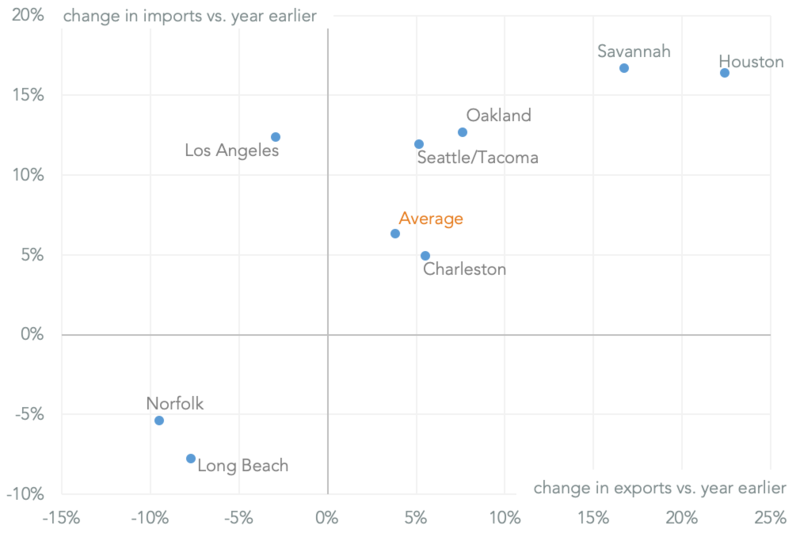 From a timing perspective a border closure comes at a bad time given shipments tend to peak in March and April each year. Leading exporters that could face disruption from a border closure include: soft fruit exporter Driscoll with $1.44 billion of exports in the 12 months to Feb. 28; Grupo Viz’s meat-packer Sukarne with $678 million; avocado exporters Mission Produce and Del Monte with $303 million and $185 million respectively; and vegetable shippers Taylor Fresh Foods and Desert Glory with exports of $251 million and $190 million. 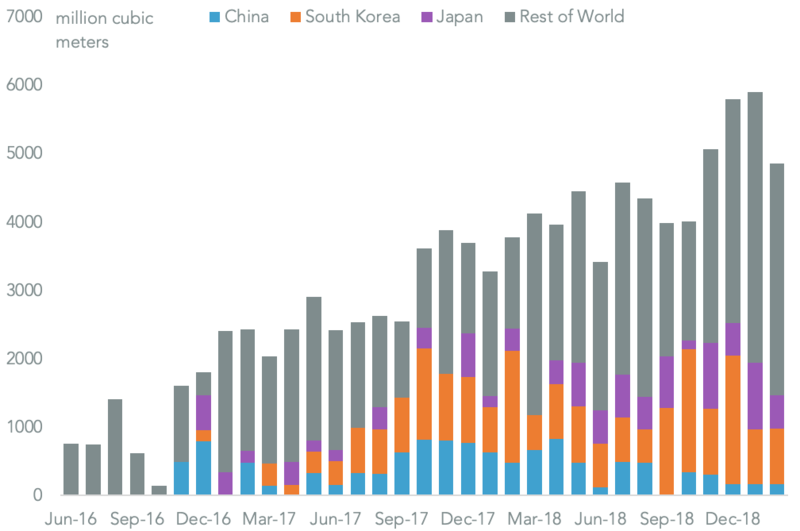 Given each exporter tends to focus on a specific product line there’s a risk that the impact of the border closures at the product will be a function of shippers’ disaster recovery planning adequacy.